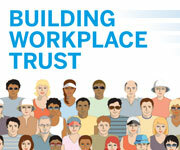 Interaction Associates' 6th annual research study tracking trust on the job, Building Workplace Trust, is out, and more than half of employees surveyed give their organizations low marks for trust and leadership. Yet this year's findings again point to how high trust leads to better outcomes and financial results — and even boosts innovation. When business teams add new apps and services to already-strained networks, IT departments are accountable for making everything work. Is your team ready for this challenge? Read this eGuide to learn how IT teams are automating their networks, why they're utilizing Ethernet fabrics and SDN, and what success looks like as they regain network control and business relevance. High labor costs in construction and persistent underperformance in terms of productivity are putting a premium on collaboration that makes the most of everyone's input, writes Rob Humphreys. Along these lines, Web-based collaboration platforms are key in bringing together designers, architects, contractors and clients.